A lot of people do cardio on an empty stomach thinking it produces better fat loss. It doesn’t. I never believed in it. So when you want to burn as much body fat as possible, do cardio some time after eating. 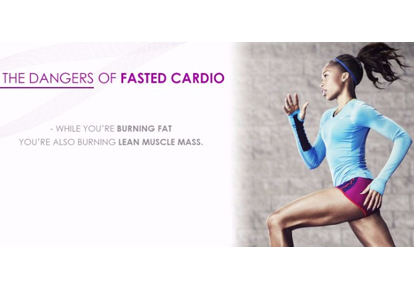 But it gets worse for FASTED CARDIO lovers…It causes MUSCLE LOSS! They don’t get enough protein to preserve their muscle mass. By the way, my Total Six Pack Abs – Body Fat Furnace program takes care of all of this. You’ll know the exact calories you need, the right macros, the best weight training and cardio to get shredded up fast! And with zero muscle loss. Or I can design a diet and meal plan for you personally here in the MuscleHack Lab – based on your stats, I’ll tell you what to eat, when to eat it, the quantities – and it’s all normal food – you can get started on the same day I send the plan to you – it’s that easy. And the fat will fall off – fast! Believe me, I know what I’m doing. In the morning, our cortisol levels are naturally elevated. This hormone wakes us up. But cortisol is also a catabolic hormone (a muscle “break-down” hormone). If that wasn’t bad enough, if we do cardio in this state, we can really sky-rocket coritsol levels. You can easily start breaking down muscle tissue for energy at this time – not just body fat. Additionally, with such high levels, and the fact that you’re in a calorie-deficit, you might not be able to bring those cortisol levels back down to normal all day…yes you can be in a catabolic state (muscle-wasting) state all day long! And many people are! That’s why so many people lose muscle when cutting. Bottom line is: if you’re doing cardio, do it in a fed state. If in the morning, after a light breakfast. Or if pairing it with weight training, do it AFTER weight training and never before ~ Mark McManus (you can ask me any questions below). NOTE: If you’re cutting, I made a list of the top 20 foods to eat to get ripped. You’ll find it extremely helpful. Just type in your email below to get it. Seriously, you must be watching me somehow? I am cutting and not a morning person at all. Today I decided to put in extra effort and wake up at 5am just to do this. Guess I will be sleeping in tomorrow. Thanks Mark. I skip breakfast and don’t eat until after an HIIT workout around 2 PM. So I’m doubly screwed if your study is correct. Hey Mark, as usual, great article. In a previous comment you suggested to take BCAAs if you do weight training in a morning, fasted state. I have recently started that hoping for some extra fat loss but no muscle loss. Reading this article, I have doubts as if what I am doing is a good idea or not. Any thoughts ?